First of all, thank you for the prayers!!! That (and possibly my threats to take him back to the hospital) worked, because Bodie was literally an eating machine today! We were totally in shock. To put it in perspective, his daily goal is 740cc's. Yesterday, he got there (just barely), but the only reason he got that high is because I was literally shoving the bottle in his mouth every chance I got and he would eat 20cc's here, 30cc's there before crying and shoving the bottle away. While it paid off (he made his goal and he gained weight), it was SUCH a frustrating experience! Today, he ate almost 1,000cc's and I didn't have to work at all to get him to eat that (most of his bottles were at least 100cc's at a time)!!! Honestly, I don't know why today was so different than yesterday. I'm sure some of it was teething and I know that teething pain will come and go. But I truly believe a large part of his turnaround was due to prayer. So I want to thank all of you for your prayer! 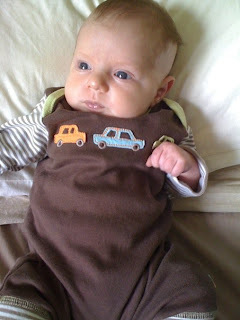 Please keep them coming - that he keeps eating, gaining weight (finally got over 12 pounds this morning!) and gets bigger! Well, it appears we have hit the terrible teething stage - at least that's what we hope it is. Bodie hasn't eaten well all day and has screamed bloody murder most of the time while eating. I somehow managed to get well above our goal of milk into him, but it was a loooooooooong and slow process. Since he is otherwise pretty happy and smiley, drooling like a madman, shoving his hands in his mouth at every available opportunity and a tooth broke through a couple of days ago, we're really hoping this is just teething. He had an appointment with his cardiologist this morning and she says all looks great with his heart (well, to be honest, she said he had forgotten how weird his heart is (besides being hypoplastic, the one ventricle he does have is abnormally thick and the right atrium is a bit enlarged), but it's no weirder than it's always been and as far as Bodie goes, everything looks great). Since he looked so good and has been satting fine all day, she says we can watch him for 24 hours or so and see if his eating picks back up. Please pray that it does - if it doesn't, back to the ER we go and I'm sure they'll admit him given his history. 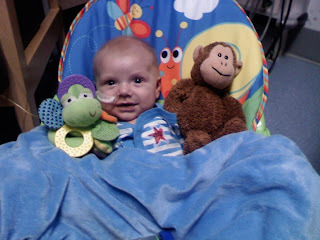 :-( PLEASE pray little man wakes up happy and ready to eat!!! In his own crib...at home...tonight...praise GOD...enough said. I always thought of myself as a fairly empathetic person...then I became a mom, and realized I had no idea how deep my empathy for another human being could run...and then I became a mom to a child with a congenital heart defect...and realized that I had only scratched the surface. Being a heart mom requires you to literally live life on the edge. Every single day you are reminded of your child's fragility, of your child's mortality, that there are no guarantees with your child. The bubble the rest of the world gets to live in? Not so much for heart moms. We don't get to blissfully dream of our children growing up, graduating from high school and college, getting married and giving us grandchildren. We get to hope, yes, we get to have beautiful, wonderful HOPE, but the hope is always mixed with fear. Because we are daily confronted with the fact that each day with our special heroes is a gift, a gift that we can never take for granted. The upside to living life on the edge? We get the privilege of living life in the here and now, with a beautiful clarity. We can get mired in the details of life, but only for so long before our little miracles remind us of what's really important. As a close friend so eloquently put it, there is this intensity to life that exists all the time for heart moms. And it's an amazing way to go through life. Tonight, I dedicate this post, and my empathy, to sweet baby Isaac and his parents Cindy, who I honestly love like a sister, and Jeff, her amazing husband. They have faced some pretty unbelievable things the past few days and have ultimately decided to lay their child's life in God's hands. They are asking the doctors at Cottage Hospital to do what they can for baby Isaac, but they have opted not to do ECMO if it comes to that. If it ends up being Isaac's time to go to be with Jesus, then they will let him go. They have such a powerful story and are such an inspiration to all who have been fortunate to come into contact with them. 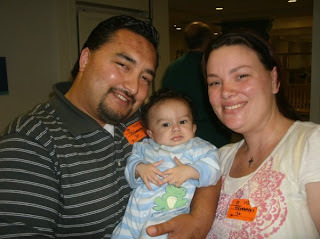 You can check out Isaac's story at http://www.caringbridge.org/visit/isaachoyos. Please join us in praying for a miracle for Baby Isaac tonight. Please take a moment today to stop and pray for Isaac. Those of you who have been following my blog for some time probably remember my stories of Isaac and his amazing mom Cindy. Isaac and Bodie were roommates for most of Bodie's 5 week stay after his Norwood operation. Well, Isaac was airlifted to Cottage Hospital in Santa Barbara and is currently on life support following a viral infection. 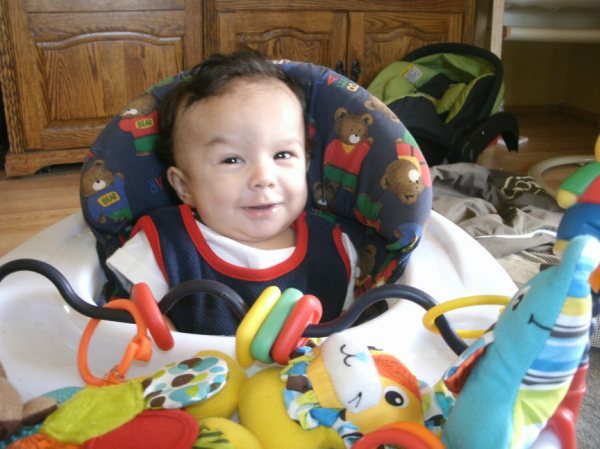 Please pray for a miracle for Isaac, and peace, grace and wisdom for his parents, Jeff and Cindy as they have to face some really difficult decisions. Please pray for Isaac today. Isaac was Bodie's roommate after his first surgery (both in the ICU for a couple of weeks and for the duration of Bodie's stay on the step-down floor). During that time, I forged a really close friendship with Isaac's amazing mom, Cindy (who, as it turns out, lives in Santa Maria, a town over from where I grew up and my parents still live - talk about a small world!). You may remember me requesting prayer and providing updates about Isaac in the past. Well, apparently, Isaac heard Bodie was giving the nurses and doctors a run for their money, and in true Bodie/Isaac fashion, decided he wanted to get in on the action. So he, now, is back in the hospital as well. :-( He has a virus (they're not sure what - they're thinking perhaps croup) and is in critical condition. They can't get his breathing under control and have increased his breathing treatments to every hour (and may be putting him on a continuous breathing mask). If that doesn't work, they will likely airflight him to Cottage Hospital. In addition, he had what they believe were 2 seizures last night, so they have put him on anti-epileptic meds. Please pray hard for Isaac's little body (that he can get the upper hand on this), for his doctors (that they have the wisdom to figure out what's wrong and properly treat it) and for his parents, Cindy and Jeff (that they would just be bathed in the peace of knowing that God's mighty hand is in control of all of this). Well, you all know how Bodie rolls - if it's possible to have an infection, he wants it - and he'll find a way to get it, even in isolation! Yesterday, blood showed up in his stool and by this morning, GI issues had set in (arching, wimpering, crying during feeds, not much desire to eat, etc.). My gut feeling (no pun intended) is that he has c-diff again, since his symptoms are exactly what they were the first time he had c-diff. Besides the fact that we don't want him getting sick again, this does present a complication in that our main test this week is whether he can eat enough to gain weight. If he doesn't want to eat because of the c-diff, it may end up looking like he can't eat to gain weight when he in fact can. So I pressed the doctors, and they got Infectious Diseases involved today and have already started him prohylactically on oral vancomycin. (They ran a c-diff culture, but it will take another day or so to get the results back.) The last time he had c-diff, he responded really well to the oral vanco (they put him on flagyll the first time, but switched to vanco last time around), so let's hope this is in fact c-diff and he responds really well to vanco again! He had been eating extremely well up until this morning and just hasn't been eating quite as well today. (Although I've been working hard to get good volume into him, I can tell the poor guy just doesn't really feel much like eating.) Please pray that his symptoms are caused by c-diff and he responds quickly to the vanco and gets back to eating well quickly! And please keep praying for Wyatt - he had more fluid build-up in his lungs, so they had to open his chest today to relieve the pressure. He's doing well now and is stable, but definitely needs your prayers for the fluid to get out of his lungs so that he can recover quickly and GO HOME!!! Bodie got moved to the step-down floor today! It seems we now have a plan. His antibiotics are done next week (I'm not sure which day - I think Wednesday or Thursday). At that point, one of two things will happen: (1) Bodie will go home; or (2) Bodie will have his Glenn. What determines which thing happens is how well Bodie eats and gains weight. If he can eat well and consistently gain weight for the next week, then they'll assume he's growing into his shunt and he'll go home to grow for a bit before the Glenn. If he can't, then they'll assume his shunt is just too big for him to grow into and they'll just do his Glenn now. So, I'm relieved because we have a specific plan - we don't have to worry that we'll be sitting around the hospital forever to see if he can grow. So, tonight, please just pray that Bodie keeps eating well and gaining weight, so that we can go home finally!!! I got some clarification from the attendings today and the general consensus is that right now, Bodie is still doing well. He has a little over a week left on his antibiotics. Provided he stays stable, and can prove that he can eat and grow consistently, he can go home when he's done with his antibiotics!!! If he cannot prove that he can eat and grow, then we'll have to relook at his Glenn. He has been eating and growing well for about the last week and a half, so right now, he certainly looks like he's on a trajectory to go home before his Glenn. However, if he decides to stop eating, that plan could change at any moment. For instance, the last 2 days, he was really cranky, didn't eat very well and lost some weight. He seemed to be doing better today, so we're hoping it's just teething - but with heart kiddos, you have to be kind of careful. 1. Bodie eats like a madman from here on out! 2. Bodie gains weight consistently. 3. We don't get any more surprises (i.e. no more infections), so we can go home soon!!! 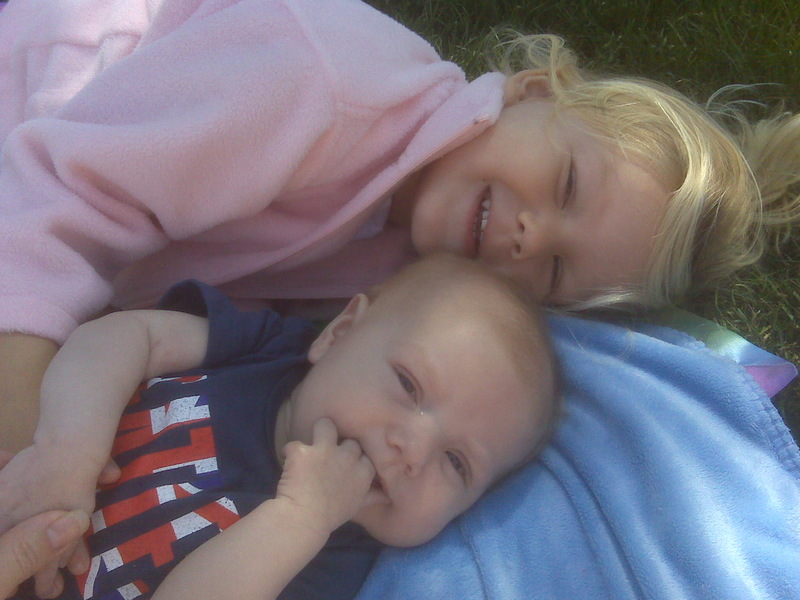 And, thank you for your prayers for Wyatt! 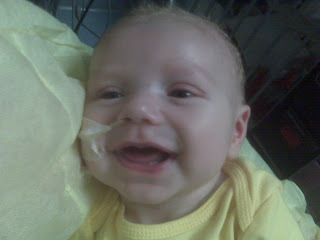 He came through his surgery well and is doing great right now (off bypass and ecmo - go Wyatt!). As with any heart surgery, the next 24-48 hours are critical, so please keep the prayers coming! But in the last 2 weeks (since the cath, basically), he really turned a corner and started gaining weight like gangbusters AND they weaned him off the milrinone without any problems. So, now they are no longer in a situation where they have to do the Glenn right now and since he's still on the small side (a little under 12 pounds and the bare minimum that they like to see is 11 pounds), they'd prefer to let him grow a little bit more. 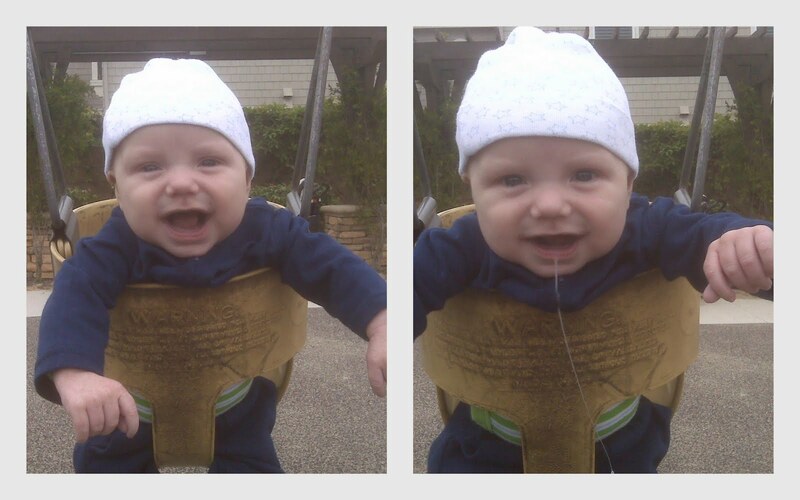 Since he now appears to be growing into his shunt and is actually growing, they want to see how much he can grow. The bigger he is, the better chances he has of having a successful Glenn. So, the surgeon wants to get him stable (i.e. make sure he continues to do well off Milrinone and finish his antibiotics) and then send him home to let him grow at home! We don't know yet how long that will be, but I'm planning to talk to the attending tomorrow to see whether the cardiologists actually agree that Bodie can go home before his Glenn and if so how soon we could come home (he still has 10 days or so of antibiotics). We'll see. I think this is really a good thing for Bodie. Honestly, it's a bit tough for us as we had mentally geared ourselves up for his next surgery and were so excited at the thought that he'd be so stable after it (most hypoplasts are MUCH more stable after the Glenn, almost like regular kids). But, we want what's best for Bodie - and if that means giving him a bit longer, then so be it. Please just pray that he continues to do well off the milrinone and that he can come home soon! Yeah, so I'm the size of Sierra's doll...what are you gonna do about it? Bodie is doing well today. We're still in a holding pattern until his surgeon returns tomorrow and then we should hear whether his Glenn will be later this week or will be put off until he can gain a little more weight. Thank you so much for your prayers for Josh. 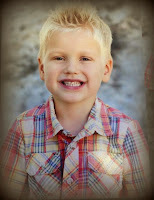 It is with a heavy heart that I tell you all that Joshy earned his angel wings this morning. He was 10 weeks old. 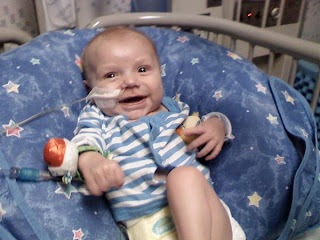 He was such a brave fighter and fought so hard, but his little body just couldn't take it anymore. 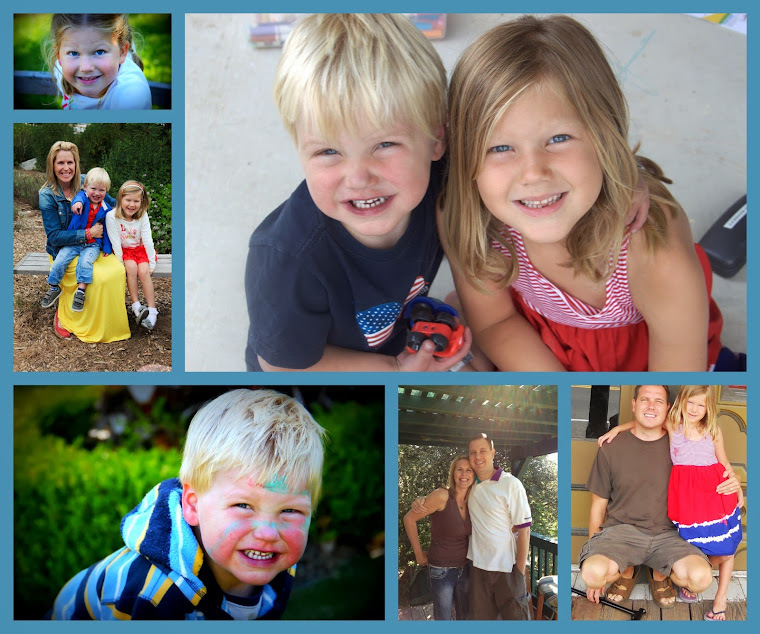 Please pray tonight for his parents Sarah and Dave, and his 2 year old brother Harrison. I just cannot imagine what they're going through right now. 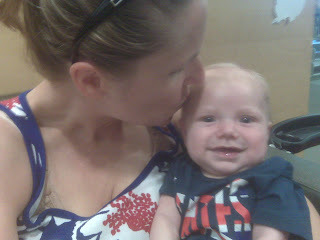 I don't think I've mentioned Wyatt on the blog before. Mostly because honestly, he is such a steady little guy and has flown through everything so far. He's a week older than Bodie and had his Norwood a couple of weeks before Bodie. (He's in Omaha.) 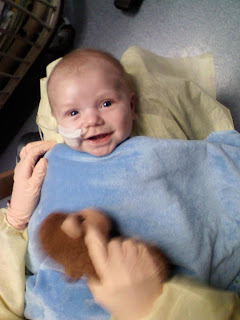 Whenever I'm talking about him to Dusk, I always say "you know Wyatt, the kid who spent 60 seconds in the hospital after his Norwood" - he spent a little longer than that, but was out in record time - I want to say 10 days or somewhere around there. It was crazy. That's how steady he has been. Well, he had his Glenn a little over a week ago and has had numerous complications from too much acidity in his blood and fluid buildup. His parents updated his carepage site today with the news that he had several blood clots and has been put on ecmo, or a portable bypass machine. You don't mess around with ecmo - really, you only use it if you have no other option. There are a lot of serious possible side-effects, including injury to the brain. But his doctors are trying it to try to give his heart a break so that his little body can recover. 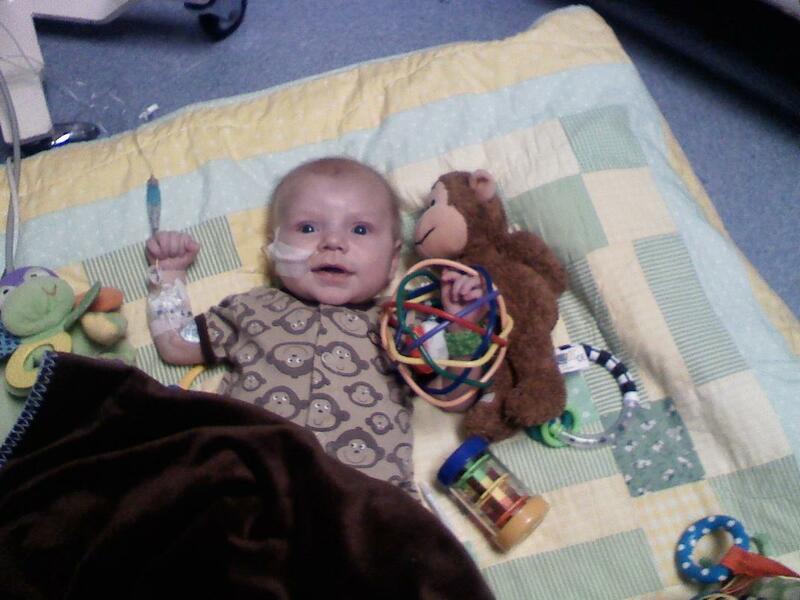 Please pray hard for Wyatt tonight, that his stay on ecmo is incredibly short and that he is recovering quickly!!! Look mommy, I found my hands!!! Not much new to report for Bodie, except that he's happy and gaining weight, which makes mama happy. In other updates, my mom's surgery was a success and she was home hours afterward!!! She's in some pain but is really doing wonderfully. Bodie's heart friend Josh has had a rougher week. He had his valve repair and Glenn surgery yesterday. They thought it was really successful, but then his echo this morning showed the valve was coming loose again, so they had to rush him back into the OR and attempt the repair again. He did ok, but the doctor's are cautious about how they think he will do. Please continue to keep him in your prayers! Bodie is doing well - has now been over 11 pounds for several days now! Praise God! He is having some issues with feeding, mainly that he has thrown up once a day for the past 4 days now. They're not sure why (they suspect it may have to do with the fact that his volume is just so high - basically, his eyes are bigger than his tummy), but since he doesn't seem bothered by it and is still gaining, they're just watching it for now. Please pray that he continues to gain and stops throwing up! My mom Nancy: please pray for my mom tonight. She is having her breast cancer surgery tomorrow morning (Thursday). The good news is that the doctor thinks he can do a lumpectomy and the tumors are estrogen positive, which means she can take tamoxifin and avoid chemotherapy. YAY!!! Please pray for a successful surgery tomorrow and that there are no surprises. Pray for her body physically as she recovers and her spirit as well. Dusk's brother Paul: His initial diagnosis of kidney stones was apparently a red herring. It turns out he has shingles and possibly some sort of immune disease. The doctors are having a hard time figuring out what's wrong and continue to run tests. Please pray for clarity for the doctors and that Paul's pain would lessen considerably. Addie is doing GREAT at home!!! 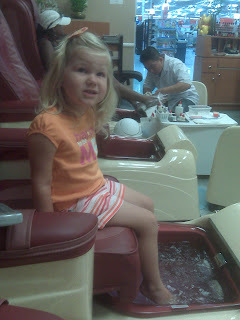 She's working on her feeding (and could use prayer for that), but has adjusted to being back home wonderfully. 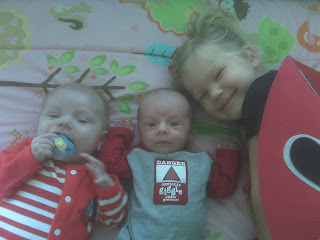 She is LOVING being with her big brother and sister. Thank you so much for your prayers for Addie and her mom Dana. 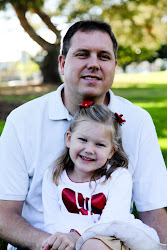 Please pray for continued increased heart function for Addie. 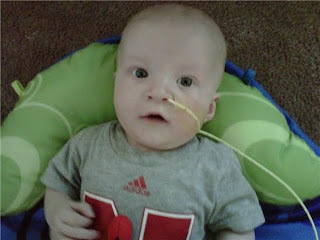 Isaac is also home and doing well, completely off oxygen and feeding tubes! He's working on gaining weight just like Bodie. :-) And, like Bodie (for the whole 10 seconds or so of his life that he's actually spent at home), Isaac is on a LOT of meds. He's also on breathing treatments. 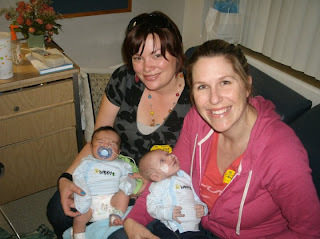 Both of which make life complicated for Cindy and Jeff, who already have 3 other young boys at home. Please pray for Isaac's health (that he can come off some of the meds) and Cindy and Jeff's sanity! And a new heart friend, Josh (Josh actually lives in London - thank goodness for things like Facebook to bring the CHD community closer together)! 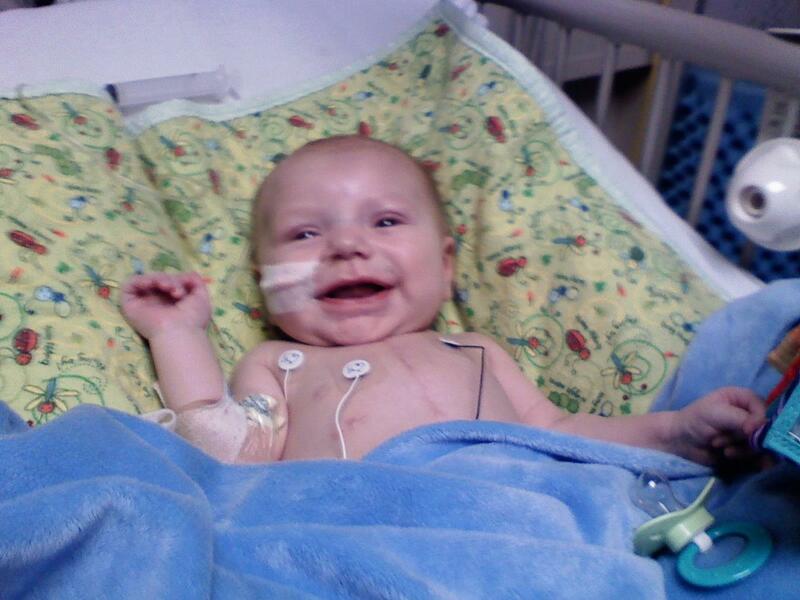 Josh is 2 and 1/2 months old and has the same heart condition that Bodie has. He was at home but was readmitted to the hospital earlier this week in extremely critical condition. They were able to stabilize him, but will have to do his Glenn surgery and a valve repair tomorrow. Although the Glenn is generally less risky, his will be riskier simply because he is so young. Please pray for a smooth surgery for the little fighter! We're still kind of in a holding pattern with Bodie's surgery. The cardiologists all say Bodie's a good candidate for the Glenn, but we have to wait for his surgeon to come back to make the final call. He gets back next Monday and then he operates Mondays and Thursdays. We know Bodie won't be on his schedule his first day back since he'll need to consult on Bodie first. So, we're all kind of guessing his surgery might be next Thursday. But, as I said, it's up to his surgeon, so he could say he wants to delay it to let Bodie gain more weight or for some other reason. So tonight, please pray that Bodie keeps on eating well, his BNP keeps dropping and his weight keeps going up so that the surgeon will agree that it's time to do the Glenn. Thanks - and Happy 4th of July!!! Cardiologist says all looks GOOD for Glenn!!! Didn't see any surprises and he's definitely overcirculating, which is just what they thought! Praise God! Have to wait to make sure attendings and surgeons are in agreement, but if they are, surgery should be in the next week or two (his surgeon is out right now, so we'll have to wait for him to come back). 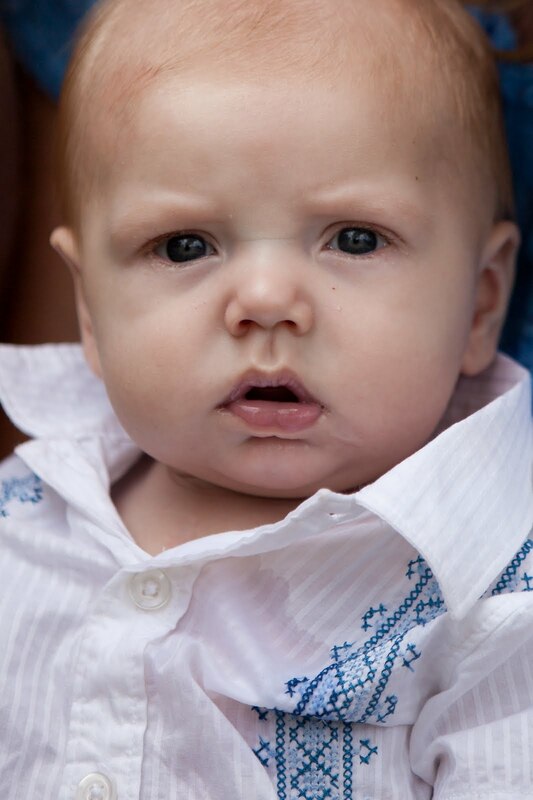 Pray that everyone agrees w/cardiologist that Glenn is best next step! They just took Bodie in for the cath (the first case this morning went way over, so they're running a couple hours behind). Will update as soon as I know anything. Please pray for good results!!! 1. His procedure itself goes well, with NO surprises and that his little body comes out fine. 2. His lung pressures are good so that he is a GOOD candidate for the Glenn now. 3. No other problems with his physiology show up. Oh, and in completely unrelated bad news, Sierra has her first cavity. I know, I know - bad, bad mommy! :-( Because she's so young, they're going to have to put her under general anethesia to fill the large cavity and a couple of smaller ones just starting. We're supposed to fit this in within a week or so. Not quite sure how we're going to do that. Please pray we get it worked out. Thanks - and I'll keep you updated throughout the morning tomorrow!